I used to use one all the time, I need to get back into it! Fantastic! I need to start using an eye cream. I've been hearing good things about #1! I'll be looking for that one! This is really helpful! I've just been using my regular moisturizer as my under eye care, but I think I'll start adding in one of these! 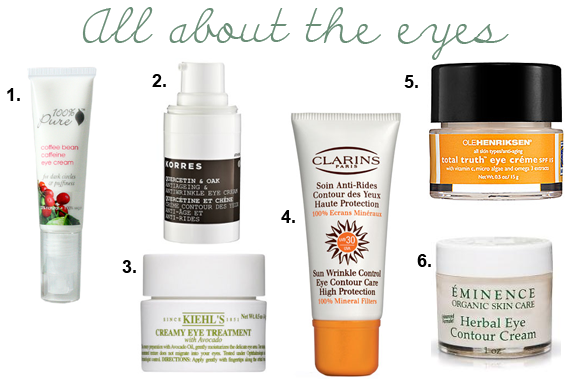 Eye creams are way more important than some people think they are. It only takes a second to apply, too! See I never knew this, although it makes complete sense! The thin parts are def more prone to wrinkles. Thanks Lindsay. I seriously need to get a new eye cream! I've been out for more than a month! yikes! Loving the blog! Such great tips! Thanks for helping the rest of us out! Im a freak about wrinkles ;/ LOVE this post! I always wanted to use eye cream but all the different kinds confused me on which one was best for my needs! I've never heard of the first one. It has caffeine so is it mostly to de puff the eyes? I use an Origins eye cream that I love! It keeps the puffiness down and helps with the dark circles, too. I have the WORST dark circles. Maybe it's genetics or the 2 3/4 children but, man, I really need to be doing this! I was just thinking about eye creams last night - living in NZ has made me terrified of sun damage cos of the ozone layer here! Are you able to recommend one for sensitive skin? I sometimes get allergies to face creams (like itchy eyes etc). thank you and I LOVE 100% Pure, I use a lot of her stuff!!! I still have to try eminence! i just got the one from avalon organics and love it... they have great products! I like the look of the Eminence one, did you like it? I got a smaple of the Henriksen from Sephora and I loved it. it was the only eye ctream I have found so far that actually felt liek it was working. Its a good product. Honestly, the best I've found is raw shea butter! Nothing would stop my eyes from becoming chapped, puffy and dry to the point of bleeding until I discovered the shea. No more severely raw eyes for me, plus it pretty much elemenated my dark circles.